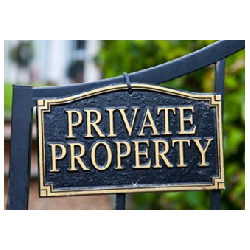 In general, pedestrians and drivers are likely to respect any private property signs, as well as any general warning signs they may come across while approaching your area. These signs can intimidate unwelcome guests and convey a sense of seriousness to alert individuals that they may be violating local laws. Rarely will law enforcement agencies ticket and prosecute people for soliciting, loitering, or trespassing on private property that is not clearly posted with these warning signs. That is why it is absolutely important to post the appropriate signage on your premises! Without these signs it can be quite the difficult task to prosecute any trespasser or to keep any traveler from entering into your property. We install federally approved fonts using high quality 3M reflective materials and 3M fade-resistant inks. With our 3M reflective sheeting our signage is visible in both day and nighttime settings. After all, what good are Warning signs if travelers aren’t able to see them well due to the darkness of night, early morning fog, or heavy sleet or snow? Warning displays must be easy to interpret regardless of weather conditions. 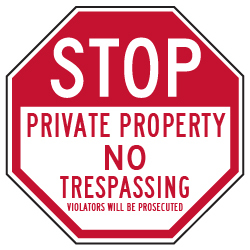 Our Warning signs about no trespassing on private property are commonly red and white with black text. The Red/Black lettering against the White background is a perfect way to contrast the different sections of text from one another making it highly legible from far distances. A great reason why our signage is manufactured to "stand out" is that you need to make sure visitors can easily read your signs. This in part is to guarantee that you will have a stronger case against any trespasser if you have signs that make it obvious the land is off-limits to the public. You may have multiple reasons to post no trespassing signage to keep strangers from hanging around your property. Whether it's for security issues or for the safety of others, not only is this a part of good property management, but this also helps to control what could be a nuisance and inconvenience for yourself, your employees, your customers, or for your residents. We not only offer No Trespassing Signage for our customers but we also have available other types of displays that can help to keep your property safe. We manufacture a variety of Neighborhood Watch signs and other CCTV security displays. You may want to take the next step in security by implementing video cameras to secure your premises. 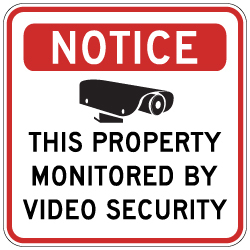 What better way to discourage strangers from entering into your area than a Video Camera Sign that warn individuals that their activities will be captured on video.